The mid-year school holiday break is coming up and I'm sure many of you are planning ski tips and other holidays - So are we! But we will actually be away the week before the school holidays. Sven and our kids are very keen floorball (innebandy/salibandy) players and we are going to Sydney to represent Wellington Floorball in Sydney AFO 9-15July. This shouldn't impact our deliveries to you too much. But if you have an urgent order that you need to get before the 15th July, please make sure to send it to us on or before Monday the 8th, so we can pack and send it off on the morning of the 9th. Give us you opinion and be in to win! We have managed to get our hands on some Discounted Anthon Berg chocolates (please note, these are NOT short dated). We are passing the discounts we received straight to you! Be in quick - these wont last long! We are looking at ways to improve the shopping experience on our website. Please help up by giving us your opinion and be in to win a gift box full of goodies from SweNZ Taste! To enter please click on this link. Answer a few questions and as a Thank you we will put you in the draw for the gift box. Some of you have asked us to delivery to you PO Box. Fastway cannot deliver to PO Boxes so we have previously not offered this service. Spiced Herring is one of the most commonly used herring flavours in Denmark. But my personal favourite is the Sour Creme and Chives Herring - and Fiskemandens Urte Sild - it's addictive - it's probably the best Sour Creme and Chives Herring I've ever tasted! 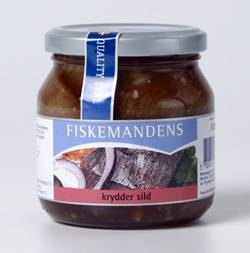 The company was founded in 1987 by Jørgen Pedersen, who as manager had long experience in the fishing industry. Jørgen Pedersen established Tenax Herring with the ambition to create better products than those offered in the existing market. Quality should be uncompromised. The basis was - and is - the herring from the clean waters between Iceland and Norway. "Herring is good" has fish wives shouted from the stalls for centuries. It is an old truth. Today it is the doctors who say it. Because herring is good for health. Real mature, fat harvesting herring tastes wonderful and it is healthy to eat. The best and coolest herring is caught in the icy seas between Iceland and Norway. It has a high content of Omega 3 fatty acids. The higher content of Omega 3, the better prevention of heart / vascular disease, and protection against atherosclerosis and thrombosis.